I first met Oluyemi Thomas in 1999. Before I met him, I met his horn. It was the Baha’i Black Men’s Gathering in Elliot, Maine. There, of all places, black men from across the Diaspora gathered to discuss theology, community building, global racism, African development, and how to transform the world spiritually. Nearly every imaginable skin tone, occupation, hair texture, socioeconomic background, religious tradition, and personal journey was represented. Former black Panthers bantered with current bankers; college students ate with retired war veterans; mechanics unleashed the dozens on degree having PhDs. We welcomed ourselves with drums. At some point somebody said: “Brothers, brothers please!…Let us pray.” And it began. Qur’anic verses were chanted, bible passages recited, Baha’i writings were sung. All were followed by the stomps, claps, and spontaneous shouts of over a hundred black men bowed in prayer. My head was down. And then, in the middle of it all, I heard it. A horn attached to a man began to pray. The sound that emerged was not of this world. Crazy high-pitched squeals cried out in furious pain. The lowest notes that could possibly come out of that bass clarinet responded back with a calming retort. God was having a conversation with 400 years’ worth of ancestors all at once—desperately trying to sooth the travails. Then they switched. God spoke in chaos and humanity replied meekly. Mortals took the low notes and God took the high. After both were exhausted, Oluyemi reminded us that the sounds also kinda came from him. He blew his breath through the horn while toggling valves in sequence as if to indicate that the horn had been broken and he was desperately trying to create some notes. But he wasn’t. God was just gone. And the world was never the same. If God actually did exist in that assembly hall in Maine, it was clear that Oluyemi knew Him, and knew Him well. If God didn’t exist, Oluyemi had the power to call Him into being at will. He prayed to that horn, through that horn, with that horn, and at that horn. Oluyemi told me privately that the horn wasn’t even a horn at all. It was a reed instrument. Earlier someone else told me that Oluyemi was famous for doing something called “jazz”—a semantic distinction that meant nothing to me then and even less to me now after reading Jason Bivins’s most recent book. I always thought Oluyemi was special—an entirely unique musical priest able to summon the spirits through sound—forcing them to rejoice. According to Jason Bivins, however, Oluyemi is not the exception but the rule when it comes to African American sonic improvisations. Spirits Rejoice! is a history of the (mostly) black but also white, Latino, and Asian American artists who have navigated the intersecting currents of “jazz” and American “religion.” Bivins hates those words. He cautions his readers to always understand them with scare quotes around them—signifying their ever fluid, multivalent boundaries that we should never assume as scholars to possess a grasp on. 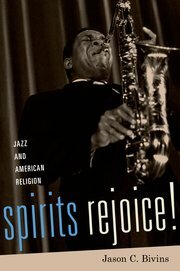 As Bivins puts it: “these sounds, these musicians, these religions elude and exceed whatever formulations we can give to them, even as they are situated in the textures of everyday life and of American history” (273). Beginning with a sophisticated, convention-breaking preface (characteristic of so many of the great disciples of Robert Orsi) Bivins asks his readers to first abandon what they think they know about religion, jazz, and the categorical lines between them. He enjoins them instead to go on an anthropologically informed journey with him deep inside the production of a series of sounds that are not only “a vehicle for the deities or the spirits appearance” but also the sacred itself (270). Traversing the fields of intellectual history, religious studies, musicology, sensory studies, and ethnography, Bivins makes his starting point the music itself and the artists who channel it. As an accomplished jazz performer himself, Bivins had unique access to a wide array of artists that he jammed with and experienced the music directly as an observer-participant. Bivins does not dwell on this positionality, however, but only hopes that he can avoid the trap of so many other white admirers of black culture “where jazz is appropriated as an antidote to squaredom” (xii). He largely succeeds while still coming across as decidedly un-square. At its core, this book is an epistemological bombshell lobbed straight to the center of the academy. It is one of the most extensive explorations of what Robert Orsi has termed “the more.” Far from just ‘lived religion’ 2.0 this approach hopes to explore “that surplus flowing beyond the format of academic writing, eluding our categorization” (21). In short, Bivins is trying use his religio-jazz matrix to describe the indescribable. He is, as Jeffrey Kripal has put it, one of the Authors of the Impossible. The sonic, smoky notes and wayward spirits that vanish in the air the moment they are experienced at a jazz concert/prayer session are what Bivins is ultimately after. One of his participants described his venture as trying to capture “smoke in a container so you can look at it” (25). But actually, Bivins wants more. He yearns instead to see the clouds of smoke that refuse to fit into any container at all. The ones that vanished—both the more and “the sound of absence” (16). In this way, he embraces, while also attempting to defy, the old saying that “writing about music is like dancing about architecture” (6). Even though textual sources are interspersed throughout this book, Bivins is methodologically skeptical of such material in general given “language’s inability to cling to the very things alleged as certain” (269). Music for Bivins is fundamentally pre-linguistic and thus part of the Lacanian ‘Real’ almost be definition. Yet Bivins refuses to believe “that we must only describe the condition of linguistic frustration” (271) when dealing with topics like jazz and religion. He challenges scholars instead “to propose in language the conceptual balance of writing simultaneously about language’s limits and writing about bodies working and experiencing in sound” (272). His way out, in other words, is through the very otherworldliness of sound itself. Thus, it is in “resistance to containment [that] we encounter language’s opening to possibility” (269). This conundrum, however, is much more than “a perfunctorily poststructuralist confession that we are always being ‘written upon’ by culture” (26). It is, in fact, a new way of doing academia—one that centers improvisation, non-linear storytelling, and a sense of wonder as part of a scholarly methodology rather than just something to be observed by scholars. Easing his readers into all this, Bivins intentionally composed Part 1 of his book in a surprisingly conventional way. His elegant prose is on full display as he chronicles first the “obvious” connections between jazz and religion. We learn about Oluyemi Thomas’s explicit incorporation of the Baha’i Faith into his music, along with his fellow Baha’is Dizzy Gillespie, Betty Carter, and Hazel Scott. We see them, however, not as eccentric, odd-ball curiosities but as part of a long line of black performers that drew on everything from Islam, Buddhism, Judaism, and Hinduism to less formalized New Age philosophies and alternative spiritual pathways. It is a world in which Saint John Coltrane is worshiped as part of an African Orthodox Church congregation (141), his wife, Alice, becomes a Vedantic swamini (144), and Chinese American Marxist composer Fred Ho joins the Nation of Islam (86). This centering of American religious diversity, places Bivins firmly within the ranks of Diana Eck, Catherine Brekus, Thomas Tweed and a growing number of scholars who hope to tell a more pluralistic story of religions in America which accurately reflects both the past and present of religious practices among everyday people. Following Eddie Glaude, Curtis Evans, and Barbara Dianne Savage, Bivins also hopes to de-romanticize the notion of a timeless and singularly construed “black church.” He shows his artists traveling back and forth between various formal denominations while continuing the long tradition of syncretic black religiosity well into the twentieth century—a period when most scholars are apt to characterize the matter as settled. In communal spaces like the Underground Musicians Association in Los Angeles and the Black Artists Group in St. Louis, this religious fluidity further mixed with both the mainstream black activism of the 1950’s and 1960’s and the more radical Afrocentric aesthetics taking shape in the 1960’s and 1970’s. Part of these projects involved alternate narratives of African American history with new starting points and fresh inspirations draw from an overwhelming number of non-traditional sources. All told, the first part of Spirits Rejoice! is academically grounded, methodologically conventional, and a contribution that even those skeptical of Bivins’s wider aims can appreciate. Part Two, however, is less Gershwin and more Ayler. It builds to a dizzying crescendo, progressing deeper and deeper into the minds, hearts, and spirits that circulate the “constructed sonic-spatial orientations to the cosmos” (190). Rather than say what I think these chapters are about I’d rather, in Bivins-esque style, just tell you to experience them for yourself. Yet at the risk of “dancing about architecture” (and trust me, ya’ll don’t want to see me dance about anything) I feel compelled to offer at least a few insights into my experiences with this part of the text. It seems that no book informed by religious studies and anthropology is complete, or perhaps even publishable, without honoring the legacy of Clifford Geertz and paying tribute to Victor Turner. While Bivins presumably bemoans this fact, he never the less pushes hard into the topics of ritual, healing, and staged performativity in Chapter 5. Judith Butler even makes an appearance but unfortunately not to provide a much needed gendered analysis, but to convey the fact that jazz and religion are both built by performers at least as much as they are expressed through their performances (156). Chapter 6 is where things really get interesting. Spirits possess musicians, altered states of consciousness become manifest, and sounds become pathways to a thoughtful, selfless mysticism. Here Bivins plays most directly with the idea of “intellectual history” asking why these ways of knowing about the world are not generally validated in academic environments that still fetishizes Western modernity while reproducing its pale epistemologies within their very structures. The alternative modernities that jazz, religion, and other African American knowledge systems embody come to their logical conclusions when in Chapter 7, uniquely conscious human beings attempt to explain the world they experience in their own cosmologies and metaphysics. Ornette Coleman, Sun Ra, and a host of other intellectually awakened artists represent a vibrant creativity whose “understanding of the sacred past connected the dots between space travel, astrology, ancient technologies, biblical numerology and cosmic sound” (221). Beyond the intimidating preface and conclusion, all of these chapters should prove easily digestible for all but the most entrenched and stuffy historians. The book’s few shortcoming are surprisingly old fashioned. Free jazz (a sub-genre I happen to love) is grossly over-represented here leading to the glaring question of sample selection. How would this story sound if smooth jazz, cool jazz, and other equally distasteful abominations were fully represented? It should come as little surprise to anyone who has even casually overheard the music of Charles Gayle, Charles Mingus, and The Art Ensemble of Chicago that these cats probably have some far out beliefs. Yes, the sweat that drips off the sweating brow is wet. But what might the laugh-worthy Kenny G have to say on the subject? On one level, of course, who cares. Bivins’ book works just fine just without incorporating such blasphemy. Yet snippy scholars will be quick to point out that such an omission means that this is only a story of jazz and religion not the story of jazz and religion. Most people, remember, are still pretty square. Speaking of squares, where exactly is the audience in all this? Did they share the same beliefs, have the same visions, and experience the same worlds that their jazz gods did? Bivins gives us few clues and admits to his narrow focus on this point, ultimately arguing that his book is more of a clef than a coda. My only other concern (besides the lack of concern to gender as noted above) is the relative inattention given to change over time (that old historian’s standby). Because musicians are notorious for their disregard of the fixity of time (‘punctual musician’ being something of an oxymoron) it is tempting to just follow them as they narrate histories that do not abide by neat lines between past, present, and future. While all of this can be seen as part of Bivins’s larger methodological intervention (and his reluctance to impose an external order on the artists and their experiences should be held up as exemplary and praiseworthy) we unfortunately learn little about what these artists mean to the larger historical processes that they were a part of. Context always matters. Again, this is less of a critique and more of a desire to hear more. All told, this book should loom large in African American history, religious studies, and anthropology. It represents the courage, passion, and devotion that is too often lacking in our current market-invaded profession. Bivins is right on. Let the spirits rejoice!